Sweden's Foreign Minister Margot Wallstrom has emerged from bitter rows with Saudi Arabia and Israel only to sink into a new quagmire over a deal for a Stockholm flat. Ms Wallstrom, 61, is one of Sweden's best-known politicians, having spent 10 years (1999-2009) as an EU commissioner and held previous ministerial posts. But now Sweden's top anti-corruption prosecutor has launched an investigation into the Stockholm flat rented by Ms Wallstrom. She obtained it from the municipal workers' union Kommunal, and there are suspicions that she jumped a waiting list. According to the daily Aftonbladet, she pays only 32 kronor (£2.60; $3.70) per month for the 89sq m (958sq ft) flat, taking account of subsidies she gets as a government minister. Meanwhile there is a housing crisis in the Swedish capital. Residents typically have to wait eight years or more to get a rent-controlled flat. The prosecutor aims to find out whether Ms Wallstrom's contract with Kommunal could be seen as bribery - if so, she or Kommunal's chairman Annelie Nordstrom could face a fine or imprisonment. Ms Wallstrom insists that she moved into the flat in April 2015 in good faith, and that Kommunal gave her false information about the deal. "I welcome the investigation. I have nothing to hide and it is good that this will get sorted out," Ms Wallstrom said. The affair is a painful blow to the centre-left Social Democrats, who are in a fragile minority government with the Greens. Ms Wallstrom entered left-wing politics as a teenager, and has long been seen as a potential leader of the Social Democrats. The party won the 2014 election with just 31% of the vote - among its worst results for decades, just ahead of the 30.7% it got in 2010. Gone are the years when the Social Democrats dominated Swedish politics and regularly scored above 40% in the polls. Now politics is more fragmented, and the nationalist Sweden Democrats are seriously challenging the Social Democrats. Prime Minister Stefan Lofven said "it would have been better if she [Ms Wallstrom] had sorted accommodation in a different way", then added: "there's no formal error, as far as I know". A Swedish politics expert at Gothenburg University, Prof Jonas Hinnfors, told the BBC that "on any issue the Social Democrats are facing potential defeat - a vote of no-confidence could come at any time". Prof Hinnfors noted that a housing scandal also hit the party's former leader Hakan Juholt, who resigned in 2012. He was accused of claiming more housing subsidy than he was entitled to. In that case, too, it was an Aftonbladet investigation, in 2011, that embarrassed the party. 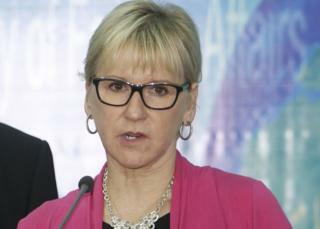 Ms Wallstrom's tenure as foreign minister has been stormy. Her first significant step in the job was to recognise Palestine as a state in 2014 - a move which immediately soured relations with Israel. Very few of the EU's 28 member states have recognised Palestine. Israel has found her recent comments about knife attacks by Palestinians to be so incendiary that it protested to the Swedish ambassador and declared Ms Wallstrom persona non grata. Ms Wallstrom had called for an inquiry to establish whether Israel had carried out "extrajudicial executions" in response to the attacks. Some 150 Palestinians have been fatally shot in four months of violence, at least 100 of them while they were carrying out attacks, Israel says. More than 25 Israelis have been killed. On her Facebook site in December Ms Wallstrom sought to defuse the row, saying her words had been "blown out of reasonable proportion". Responding to angry Facebook messages, her spokesman explained that she had been criticising "disproportionate" reactions to violence, not accusing Israel of "extrajudicial executions". Earlier last year Saudi Arabia recalled its Stockholm ambassador after Ms Wallstrom criticised the Saudi human rights record, especially the restrictions faced by women and the flogging of a dissident Saudi blogger. She defended her criticisms of "medieval" Saudi practices, saying she had received many messages of support. Her outspokenness on human rights is part of what she describes as a "feminist" foreign policy. The Saudi-Swedish diplomatic quarrel is reckoned to have cost Swedish arms manufacturers millions in lost contracts. Her stance caused anxiety in Swedish business circles. But Prof Hinnfors said plenty of Swedes - especially on the left - applauded her defence of human rights. "Opinion polls indicate that a majority of Swedes say yes, they are feminists - so her foreign policy is not a break with the general sentiment," he said. There has also been tension with Morocco, since the Swedish parliament voted to recognise Western Sahara as an independent republic. Formerly a Spanish province, the territory has been under Moroccan control since 1976. But last week the Swedish government decided against recognition of Western Sahara, pledging instead to help UN diplomatic efforts. Reports in Sweden pointed out that Rabat had put pressure on Swedish politicians and threatened to block the opening of Ikea stores in Morocco.